passionate of what i do and always want to gain more skill and experience. 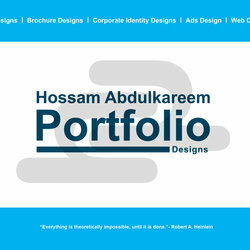 My name is Hossam Abdulkareem. I am a freelancer Graphic Designer looking for an opportunity to work in a respectful, professional company.I am a hardworking person and love to learn new stuffthat can enhance my skills. I am passionate of what i do and always want to gain more skill and experience.